Like me, you’ve probably lost a few nights sleep over conflict at work. Like me, you’ve worked in organizations that could be much more successful if destructive conflict was eliminated. And maybe, just like me, you want a working life for yourself and for future generations that contributes to wellbeing, instead of being a source of anxiety, frustration and, yes, anger. In conflict, when we force our way or when we yield to the other someone always gets hurt. Ten years ago, I began a journey to create a better world of work. It turned into two graduate degrees, a consulting company and many opportunities to speak and write about work. Whether in my blogs, the book I’m in the middle of writing, a multi-day workshop, or various speaking opportunities, there is one thing, often mixed in with many others, that keeps coming up. What if one change could create a world of work that is a source of wellbeing for you, for your coworkers, and for your children who are advancing toward an adulthood where they will, just like you, spend more time engaged in the many aspects of a working life than the time spent with their intimate partner or even with their own children? Would you make that change and help others change too? I think you would. I’m trying. I focus on this one change everyday. It’s not easy, but it’s worth it. When we compromise during a conflict, each person incorporates the views of the other into their own, but no one really gets what they wanted in the first place, so the outcome is actually lose-lose. When we avoid conflict, one person may get their way or perhaps no one gets their way, so it’s either a win-lose or lose-lose. When we force our way or when we yield to the other it’s always a win-lose. The only way to make the outcome of conflict a true win-win is to collaborate to solve an actual problem. But this seldom happens because something gets in the way of agreeing on the problem and working together on the solution. What’s that one thing that always gets in the way? 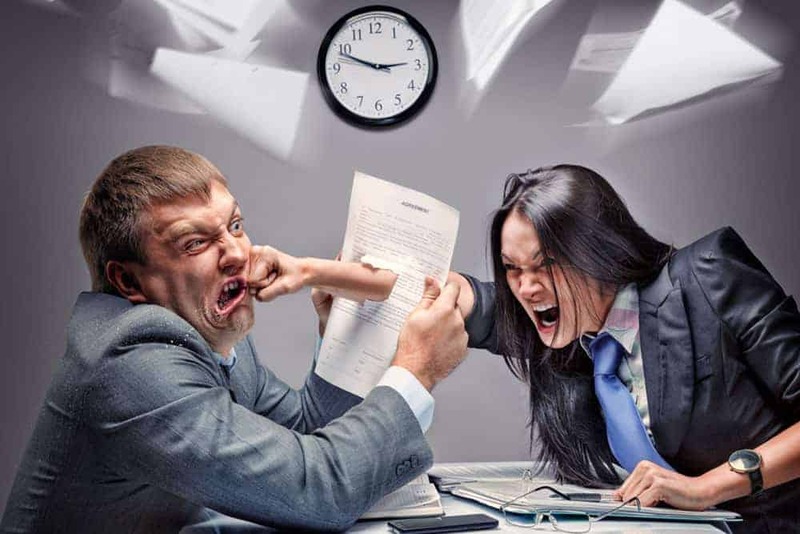 A few blogs ago, I discussed the destructive power of workplace conflict. But the source of conflict really comes down to that one thing we can change: we fight too hard to be right. Why do we fight? Defending our worldview (strongly-held beliefs about the way things are and ought to be) is as normal as eating, sleeping and all the other natural things humans do. Many thought leaders have come to understand that a worldview defense may be the source of most human suffering. And, on a much smaller scale, we do it nearly everyday at work. But as soon as we understand the destructive power of a worldview defense, we can back off from the fight, let go of winning and re-engage as collaborators. 4. If the other person won’t collaborate on steps 2 and 3, then your decision to keep forcing or to yield is based on which approach will likely create the least anxiety in you; at least you did everything you could to reduce the conflict. if I had a dollar for every time I did step 4 . . . Even though step 4 is your last resort, you’re still going to do it a lot. Step 4 is usually how things play out because most people don’t know how deeply committed they are to their worldview, and are unaware of how vigorously they defend it. But we can create a better world of work by toning down our worldview defense and collaborating on solutions that truly benefit the organization. We can do this by working through steps 1, 2, and 3, instead of going straight to step 4. To learn more about the global destruction caused by defending worldviews (not about our relatively tiny workplace conflicts), check out the documentary film, Flight From Death.